There are two kinds of men in this world: Men who own drain augers, and men who do not have drain augers but sometimes really wish they did. Males who do not know what drain augers are are not men. Men who call them drain snakes or cables are men, too. People who think drain augurs tell the future from the way plumbing parts fall to the ground after being cast into the air are interesting, but they are not men. Masculinity has a very complex set of rules, as you can see. So this morning, while I was preparing to shave, my basin’s drain fell closed and became unresponsive to the manipulations of the opening and closing mechanism. I had to use my wife’s basin, and it drained very slowly indeed, as she wears her hair long these days. I knew I could call a plumber to come clean it, but no. I am of the first type of man (being one who owns two augers: a small drill-mounted one and a smaller one designed exclusively to scratch up your toilet bowl while you clear a clog). So I disassembled two drains, cleaned the p-traps, and used the auger to push any blockage deeper into the pipes where my auger cannot reach it. I have found that my drain stop became stuck in the closed position because its horizontal rod (where the stop rests) had actually rusted through and broke off so that the spot that should have held the drain plug open was actually in the p-trap. Do you know what I mean? Score yourself two Man Points. So I will pick that up this afternoon and replace it (a five minute repair), and after I reassembled the p-traps, water is again flowing from the sink basins (and not into the cabinets under the sink, bonus). I’ve done nothing else this afternoon, but when one does a home repair this complex, one can coast on it for a while. Of course, I do know what this ultimately means: people will know I have an auger of some sort and will want to borrow it. You know, in the 1982 film Poltergeist, at the very end, the whole You moved the cemetery, but you left the bodies, didn’t you? thing? That doesn’t make sense. I mean, look at it: it’s a completed subdivision with fire hydrants, roads, and basements. There would have been a lot of construction, digging by a lot of different groups of people, from the water company to the electric company, not to mention the people putting in the houses and the swimming pools and whatnot. You’re not going to cover up leaving the graves. Seriously, they would have plowed up a lot of people. 29 years after the film comes out, I’m suddenly bothered by this. UPDATE: So I’ve heard that it makes perfect sense in California, where due to homes on slabs, corrupt contractors, and lack of a frost danger meaning they leave the utilities lying on the ground instead of burying them deeply, that Poltergeist is accurate. I’ll broaden my point: That state where this 30-year-old movie was set doesn’t make sense. Well, it’s not as bad as all that, but you do kind of start keeping score about how many bad guys would be likely to vote Republican, don’t you? In this particular novel, the bad guys are a bunch of people in a free-lovin’ (and “free-lovin'” includes children) religious group out in the hinterlands. Some kid, a gay football star held back from college ball by an injury, kills a farmer at a grain elevator, which in turn leads to a deputy who’s in the free-lovin’ church killing him, who leads to someone killing the deputy to silence him. Virgil Flowers comes to southwest Minnesota to investigate and to romance the lady sheriff in town. As with Sandford novels, the action jumps between the good guys and the bad guys, so you know whodunit and why very early in the book, and the real puzzle is how the cops will prove it and deal with the political fallout. Frankly, it’s a bit of a narrative cop-out, no pun intended, but it does keep the plot moving along (and the writing of the novel, I’m sure). 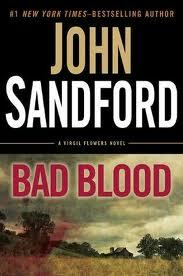 This book hits a bang-bang climax, but that’s not the climax. Instead, like the book Painted Ladies, we end up with a later ‘climax’ where it comes down to a dysfunctional family resolution wherein the protagonist is present, but really is only a witness to something happening, which is also dissatisfying. So it’s a disappointing book overall, but it’s paced well. So you might not mind the disappointing elements if you don’t think about them too much or if your taste varies from mine. After someone dies, you know if someone close to you has died or you attend estate sales, the families are left with a pile of the effluvia of daily living in addition to the fine china, the antique buffet, and the savings bond worth $25 that is not worth putting through probate. 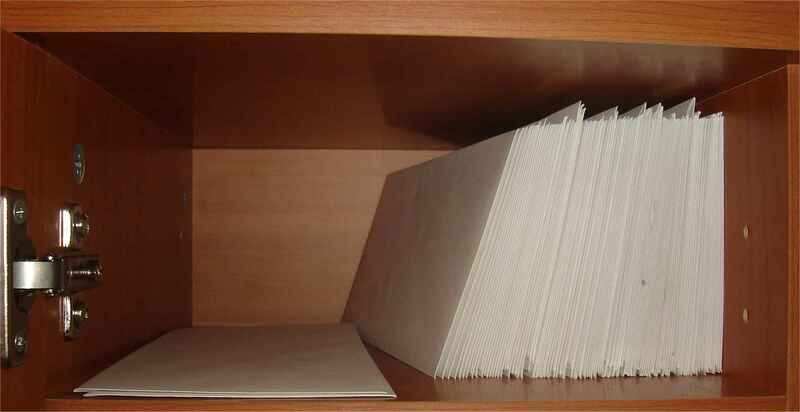 In my family’s case, I have inherited a number of office supplies. Yesterday, I used a number of those heirlooms. I hate to get rid of the little scribbles in her handwriting, because her handwriting is now a fixed, limited resource, and every sample lost will go unreplaced. Although I’m melancholic and maudlin, I do let those go. 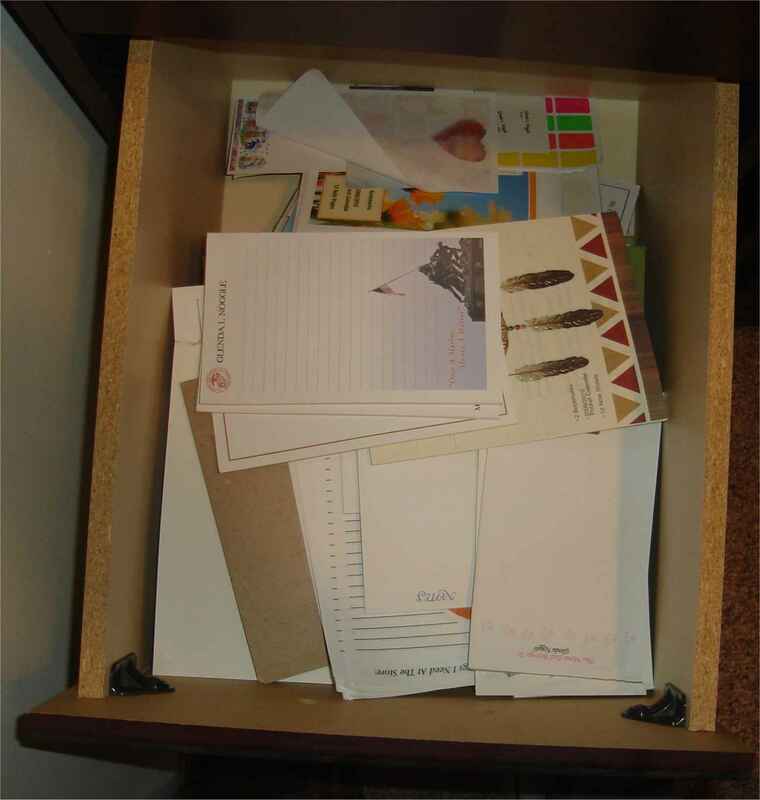 My mother’s only been gone for two and a half years now; my Aunt Dale has been gone for five or six, and I still have a pile of her office supplies. Report covers? Got ’em! A metal stand for a reference-style book or catalog? I don’t know what I’ll use it for, ever, but I still have it. Come to think of it, I don’t know what she would have thought she would use it for. Just simple little things, little office supplies, but reminders of my ancestors. Well, my mother and my aunt, anyway. Both of them would be pleased that I was frugal and thrifty enough to save these things and to use them. And, probably, to remember the sources. The NHL sent me an email with the BREAKING NEWS: subject line prefix. For what? A plane going down killing lots of NHL players? 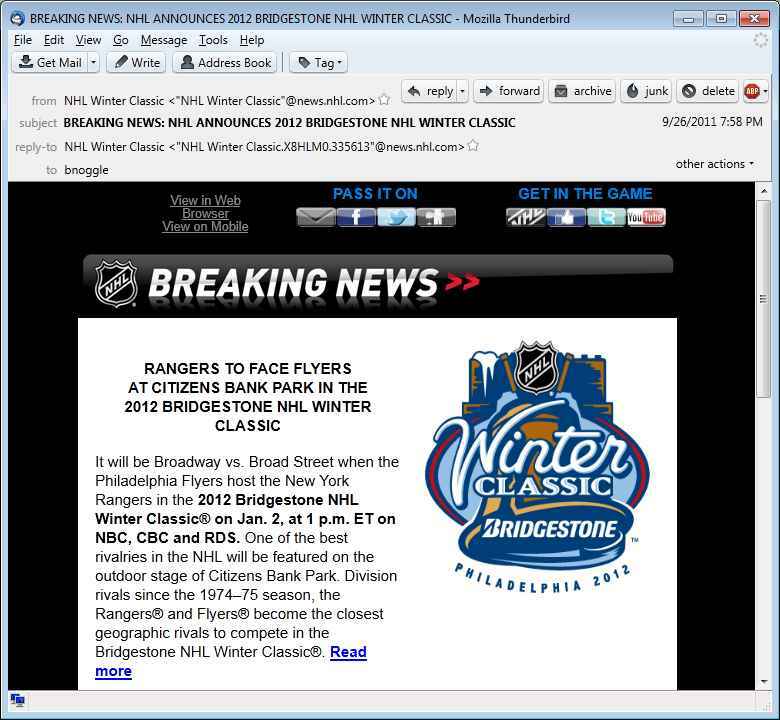 No, silly, the fact that the NHL has scheduled its annual outdoor game. For January 2. 2012. Wow, let me rush right to my television at 9pm on a Monday night to see if ABC has broken into its regular programming to go to live coverage of this life-altering event. No, of course not. This is a run-of-the-mill press release, and someone in marketing hoped that only the BREAKING NEWS: portion of the subject line would show up in the lower left hand corner of the desktop so people would click through. But there’s far more than that to Ben Macdhui. The mountain is the reputed home of a vile and terrifying man-beast: the Big Gray Man, as it has become infamously known. Indeed, while on Ben Macdhui, witnesses to the phenomenon known as the Big Gray Man describe how they have variously encountered footsteps, a sensation of a “presence,” occasional sightings of a large humanoid creature, and an overpowering sense of panic. I should add that Big Gray Man should not be confused, either, with the "Little Grey Man". Well, now I’ve done gone and finished the series. 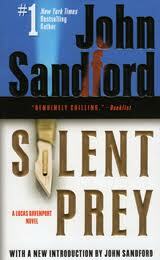 Since I just took Painted Ladies back to the library, I picked up the last book in the Spenser series. Well, the last Parker wrote. Whether his estate keeps it going or not, this is the end of the series for me. This book borrows a bit from Early Autumn, as Spenser takes on an apprentice to teach him how to be a man. It also borrows some from Stardust, High Profile, and the other show business plots in that it deals with a movie star (not a television star, not a radio talker, so completely different! ), a large movie star, who might have killed a girl during some sexual games (fortunately, most modern audiences won’t know Parker is recycling Fatty Arbuckle). Complications ensue when Spenser not only gets fired for insubordination, but continues to discover that the mob owns this particular movie star as a money laundering device. It’s recycled, and longtime fans and history buffs will know where it comes from, but it’s still not among the worst of the books involved. Again, Parker doesn’t summon the posse to help him, relying on his new apprentice, a native American. It’s not like Gerry Broz or the zombie version of April Kyle appear. The chapters follow the recently common chapter of action followed by chapter of talking to Susan trope, but at least though she’s a therapist, she’s his girl. So it’s probably worth a read. Also, given that it’s written in the OE and not the DYB (Dark Years of Bush), there are no gratuitous jibes at Republicans or Bush in this book. It gives me heart that there’s a block of time in which modern detective fiction is written that does not slap at half the country to prove the detective or narrator is a sophisticated thinker. You know, maybe I will try one of the new guy’s Spenser books. I might like them better than some of Parker’s postings. But I need to get out of the habit of getting books from the library. I have enough books to read now. And as for my Parker collection, as some of you know, I have one of the best Parker collections in Missouri if not the country. I’ve gotten out of the habit of buying the books whether new or used, but I’ll probably fill out the collection from used book fairs and stores as time goes on and through Ebay (for the hardback of Mortal Stakes, the only one from the early ones I lack in hardback). I used to have images of my collection on Geocities, but that’s gone now, obviously. If you’re interested (or, more to the point, if you don’t explicitly stop me), I’ll get those up sometime. 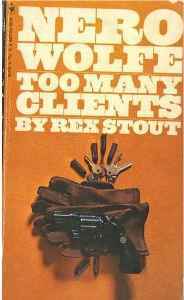 This Rex Stout / Nero Wolfe mystery starts out with a quick twist: Archie is hired by a businessman to follow him to a certain address, but the businessman does not show as scheduled. Instead, police are surrounding the address, as the businessman has been found dead in a construction site across the street. However, the corpse in the hole is not the man who talked to Goodwin. There are more twists in this book in the first thirty pages than you see in many books over the course of 300. The book cannot sustain the twisting over the long haul, though; we discover that the real businessman, who is the dead businessman, had a love nest at the address where a variety of women came to call. One of them might have had a hand in the murder, and Wolfe and Goodwin investigate. It’s stretched a bit to novel length and relies a little bit on deus ex machina of Wolfe cogitating and using detectives other than the first person narrating Goodwin to set up the big finish, but it’s not a bad novel. It is a little strange, though, that this book came out in 1960, nine years after The Book of the Crime, but Manhattan feels vastly different between them. 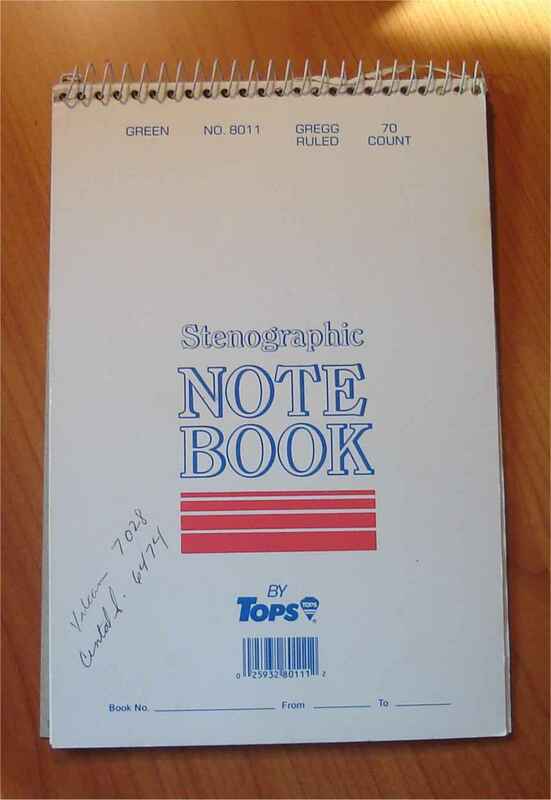 In this book, it’s relatively modern, and but barring the lack of smart phones and computers, might be modern day. As a reader, I’m fortunate enough to remember those times, so I can relate to fiction written before 1998. And as a side note, this novel appears in a three-book-omnibus edition of Wolfe stories. Because I’ve just about given up on hitting 100 books this year. I had a certain sadness reading this book, the first Spenser novel published after Robert B. Parker’s death. 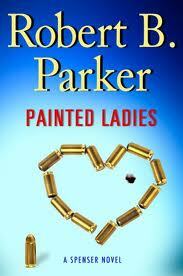 The copyright notice even attributes the copyright to the Estate of Robert B. Parker. Even though I’ve been a bit rough on him in book reports for the better part of a decade now, his early works still meant a lot to me. An art expert and college professor engages Spenser to guard him while he conducts a ransom-for-old-painting swap. A precise bomb kills the art expert after the swap, while Spenser is still on the job, so Spenser tries to track down the art thieves. In the course of events, he finds himself as the target while investigating an elite ring of mercenaries and art thieves who might be seeking to right art confiscations from World War II. This book eschews some of the pitfalls of the later books. When he’s the target, Spenser has the chance to summon the rainbow posse of multicultural tough guys from around the country, but he does not. The book mixes in a large number of allusions to classical literature, but it still hits the regular Spenser catch phrases (“Tough, but oh so gentle” and “Pretty to think so” and whatnot). Additionally, the plot is a little forced, particularly the resolution, which takes a ring of the aforementioned international mercenaries out for Spenser and turns in a resolution based on a bad mommy and daddy domestic situation. A couple of the plot elements and set pieces within the book might also have been lifted pretty much wholely from the early works. So it’s not too bad, but not without its flaws. Knowing that Parker won’t pen any more of them, good or bad, still saddens me, and I’m not sure how I feel about the series continuing without him. Light speed denialists must be silenced! Physicists on the team that measured particles traveling faster than light said Friday they were as surprised as their skeptics about the results, which appear to violate the laws of nature as we know them. The team – a collaboration between France’s National Institute for Nuclear and Particle Physics Research and Italy’s Gran Sasso National Laboratory – fired a neutrino beam 454 miles (730 kilometers) underground from Geneva to Italy. Strange how an experimental science, whose results can be tested and proven or disproven, can have the potential for startling, paradigm-shifting upsets, but untestable sciences like climate modeling and evolutionary biology, are somehow infallible through imperfect study with small sample sizes and human interpretation. A satellite falling from space, like Skylab in 1979? Seriously? This one is probably not even his fault, but when it rains, flaming technology wreckage literally falls from the sky. Where were you when Skylab came down? Me, I was nine, living in the projects and already I just knew that the space station was going to land on me. My fatalism is not a recent thing, gentle reader. I’ve been steadily improving it for decades. Hey, shoot me your APO or FPO address and get a free copy of my novel John Donnelly’s Gold. This is a popular series, so why not continue it? I don’t mean popular because people read it; I mean popular because I like it because it spurs me to get the random enumerated things off of my desk. A child lock that I blogged about over two weeks ago. A paper-printed bumper sticker that says “I’m On Spenser’s Case With Robert B. Parker and Dell” that I got for free when I won some Ebay auction for Parker material some years ago. A map of Greater Kansas City, Missouri. A broken necklace my wife expects I’ll repair. A bag of rocks and minerals sent by my Nana for my children; I’m hoping to make a shadowbox out of them, but I have yet to do so. I’ll need a razorblade, and there’s not one on my desk right now. That I know of. 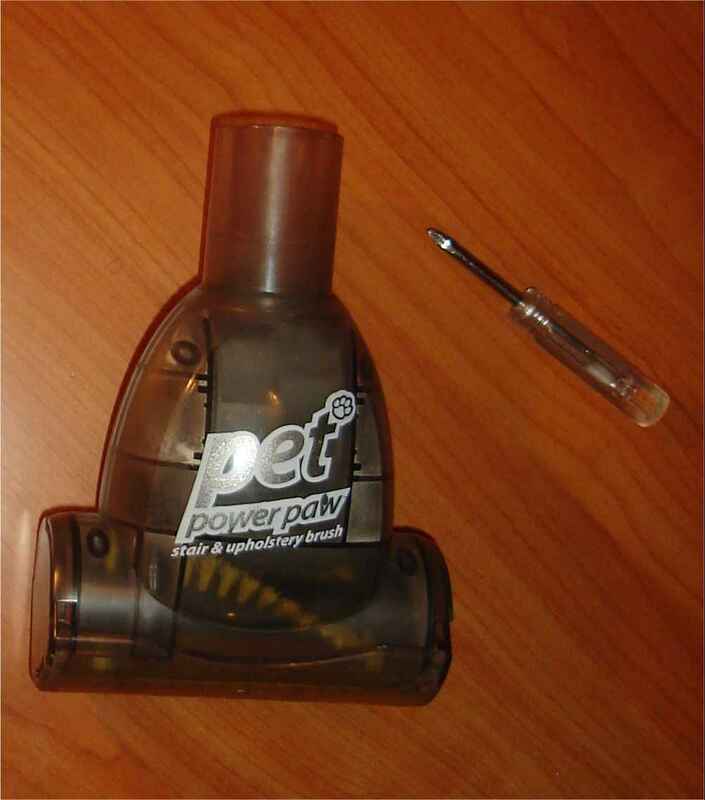 So, some months ago, apparently I put a Power Paw vacuum cleaner attachment on my desk because it needed to be cleaned out so that the little spinner gizmo in it would spin. Apparently, some months ago, same Power Paw fell between a disorganized organizer and the side of the hutch attachment on my desk, which means it lie hidden there between desk cleanings until such time as my wife really, really wanted to use it and actually ordered another one, waited for it to arrive, and then used the replacement for whatever she wanted pawed powerfully. At which time I found it. And moved the organizer so it’s touching the hutch so nothing can fall in between the two. Weeks pass, but this morning, I had a couple of moments to kill, so I picked it up, unscrewed the two Philips screws holding it together using a small screwdriver that also happened to be lying on my desk, and knocked out a bit of dust to unlock the little gearwheel. The complete fix time: about 5 minutes. The turnaround time: Probably 4 months. It’s strange; I’ve borrowed a number of the later parts to this series from the library, and this is an ex-library volume that I own, so I kinda felt like I had to be extra careful with it when I read it. Even though, as an ex-library copy, it’s obvious that other people have not been as scrupulous as I. I passed this book a number of times on my shelves, each time a little surprised that I owned one of Sandford’s books that I had yet to read. Finally, the time was right, and I happened to spot it sometime other than I was 300 pages into a 600 page science fiction or high fantasy epic. It’s an early volume from the series; number four, I think. Davenport has not yet become the political fixer cop he does later, although he does get a glimpse of that lifestyle as he travels to New York to try to hunt a serial killer whom he’d already captured in Minneapolis but who escaped custody. The killer is strung out on drugs and–wait for it–does gruesome things. Seriously. Although he just dumps the bodies and does not pose them ritually, which differentiates him from some of Sandford’s other villains. As Davenport purportedly is supposed to draw press attention from the actual cops hunting the serial killer, he’s also commissioned as an outsider by a secret intelligence project to find a group of vigilante cops who might be vigilanteing. So there’s another thread here with lots of intrigue. It’s an okay book, but Sandford does a very, very naughty thing: he withholds a very pertinent bit of information so he can spring it on us as a surprise. The bad guy is crossdressing to get his victims. So we get him all out and about and whatnot, and this pertinent bit is not revealed until an interview with a jailhouse neighbor transvestite reveals that the villain learned how to do it right from him. Then, suddenly, we get passages of the villain dolling himself up and mentions that he’s walking in heels, and so on. I mean, he’s hiding out as live-in help for an elderly woman by wearing drag at all hours, and this is not mentioned until two-thirds of the way through the book. Oh, for Pete’s sake. The Wall Street Journal must have learned something from reading Troglopundit. Note how on Thursday, it ran a story entitled "Banks Apply Lever to Cash Positions" about…. Well, I’m not versed enough in finance to really understand what it’s about. Cash positions and leverage and interest or something. What does the venerable newspaper choose to illustrate the concepts in this article? I may not understand finance, but I understand Danica Patrick. Well, maybe that’s presumptuous. 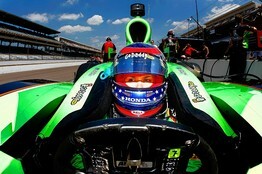 I understand Trog has a thing for Danica Patrick. I feed my children McDonald’s Happy Meals on occasion. I hesitate to confess on the Internet because in England, this might be grounds for forcible removal of the children from the family. But there it is. I also pride myself on being a knowledgeable sort of father, one who can answer most any question in a greater detail than a kindergartner or preschooler can actually retain. It’s important to do so to keep up the illusion of omniscience as long as possible. Happy Meal toys, the little trinkets that come in with the chicken nuggets and apple dippers with white milk to drink (thereby mitigating, somewhat, the dietary destruction of McDonald’s), have been pretty good to me in this regard. Most of them recently have been rehashings of things from my own youth, so I can give great detail. Marvel superheroes? I can speak at length about Captain America, Spiderman, Iron Man, and Avengers story lines. D.C. Superheroes? Go ask your mother. Smurfs? Yeah, I can talk about the origins of the mythos from records to cartoons to the creation of Smurfette. I’ve known this stuff longer than I’ve had a college degree. Some of the toys are archetypal. If it’s a little animal, I know it’s from the latest environmental propopanda piece du juor, and the plucky animals are the heroes and the men or the animals in favor of civilization are the villains. They never make the toys out of villains for these sorts of films, as they want children to identify with the cute animals. Oh, and Star Wars. Every couple of months, something new from Star Wars, trying to get the children hyped up on the new going concern, the Clone Wars, a series so ethically muddled that the storm troopers are the good guys, Anakin Skywalker is a hero, and at the end of the series, Anakin Skywalker is going to kill all his allies. Seriously, how can you not root for the freakin’ Hutts to rub him out at some point? Regardless, I know a lot about the overarching stories if not the specific Clone Wars adventures. I’m less clear why they built ships with the cockpit on the top, set way on the back. Because in space, too much visibility of the enemy might drive you mad or something. Or George Lucas is a tool. But now, out of nowhere, we have a toy from some mythos of which I have no knowledge: Ben 10 Ultimate Alien. I can’t suss it out. The name doesn’t tip anything of its story. The toy is some child embedded in a larger translucent monster or alien. Did the boy turn into that? Did the monster eat the child? Is this particular translucent alien/monster a good guy? I just don’t know. Way to make me feel forty, McDonald’s. Now that you’ve reminded me I have to watch my diet, I’ll have to cut out the fast food for my children and me. How does that suit you? As much as the largest metropolitan area and its declining city center might like to think that the rest of the state is just an extension of itself (and a touch for taxpayer-funded public/private partnerships), the rest of us are looking for the opt-out link. This Lysol 4-in-1 Foaming Bathroom Cleaner should be tagged with With Real Police Shooting Action! Jeez, every time I pulled the trigger on the pump, it shot out a stream of foam that ricocheted and splattered so that for every spot of foam I got on target on the surface to clean, I got a half dozen spots of foam on the surrounding surfaces, including the ceiling and floor. No matter how I tried to angle the bottle or the distance from the surface, and I was a couple sound effects out of a Western where the mildew is the hero and I’m the outlaw. I searched the Lysol Web site so I could show you the exact product I’m talking about, but it’s gone. Apparently, I’m not the only one concerned about scattering caustic chemicals willy-nilly to save the world from some evil modern equivalents of chlorofluorocarbons (just as evil as CFCs! Ban them next!). Wait a minute, you mean that shower door isn’t frosted glass? I have thought since we lived here that the door was frosted glass. An incomplete splatter-pattern of cleaning chemicals later, and I’m looking out of my shower. Did the previous owner sell us a house with a dirty shower door? Well, in all honesty, I’d do it to someone else. Especially as dirty as this proved to be. Dammit, woman, I’m a man! How am I supposed to know the difference between a bath loofah and a toilet brush?